I grew up in Sioux Falls, South Dakota. As a child, my family made many trips to Nebraska to cheer on the Huskers and visit my relatives. I knew early on that I wanted to attend UNL and be a Husker myself! During my 4 years of college at UNL, I met my husband Andrew. I attended dental school at UNMC from 2005 to 2009. 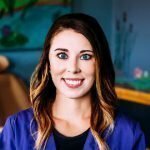 During my dental school years I realized my passion was for pediatric dentistry. 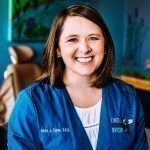 I finished my pediatric residency program at UNMC in Omaha, and started practicing at Lincoln Pediatric Dentistry in July 2011. I am a Diplomate of the American Board of Pediatric Dentistry, and a member of the American Academy of Pediatric Dentistry, American Dental Association, and the Lincoln District Dental Association. Andrew and I enjoy watching Husker football, golfing and spending time with our 3 children, friends and family.